The telephoto lens has 20 times zoom, which can adjust the focal length well. It can also work as a monocular. Fit most kinds of mobile phones, include flip phones and bar phones, mobile phone&apos;s quality of imaging can be improved evidently. Phone has back camera, can be connected to the telephoto lens through the clip. Applicable to watch the game, concerts, tourism, observe animal lovers, news reporter long-distance shooting, geological exploration, forestry management, railway port scheduling and etc. 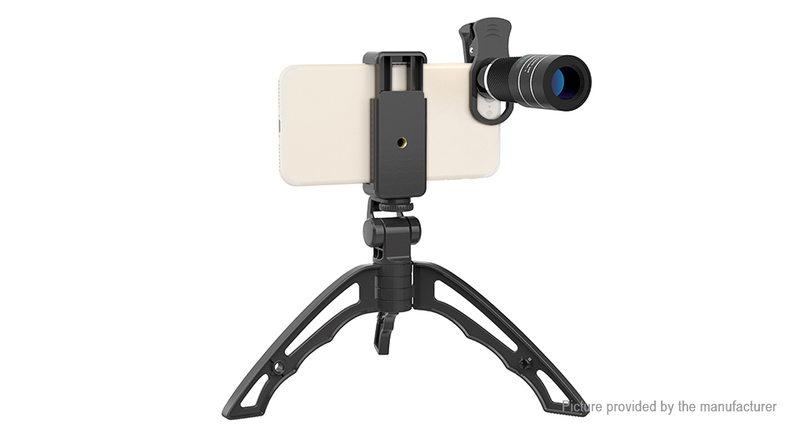 The included flexible tripod is made of hard plastic and aluminum alloy. 1/4 inch top screw is suitable for most digital cameras. 360&apos; rotating, you can use it anyway you like. Also comes with one lens clip for lens mounting on your phone, one cleaning cloth for lens cleaning and a waterproof cloth pouch for storing all of them.